Howard Shore is best known for his acclaimed score to Peter Jackson’s film trilogy The Lord of the Rings, adapted from J.R.R. Tolkien’s famous set of novels. He won an impressive array of awards, not least three Academy Awards, but Shore is an eclectic composer and although most of his work is for film (he also worked with such directors as David Cronenberg and Martin Scorsese) he’s spread his creativity into other very different styles of composition. His opera The Fly premiered in 2008 at the Théâtre du Châtelet in Paris, In 2010 he wrote a piano concerto entitled Ruin and Memory for celebrated pianist Lang Lang and in 2012 a cello concerto named Mythic Gardens, commissioned for distinguished American cellist Sophie Shao – to name just a few. 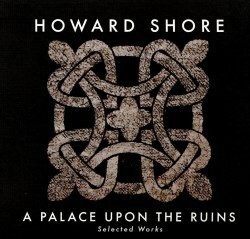 As the title and subtitle of the recording hint at – A Palace Upon The Ruins, Selected Works – I think this is CD seeks to showcase Shore’s versatility as a composer. The first piece, which gives the album its title (tracks 1 to 6), is a song cycle in the style of Lieder. The lyrics are by Shore’s wife Elizabeth Cotnoir and it is unclear why she wrote them in German unless, as I suspect, it was to stress the ‘Lieder-effect’. I must say it is a very good song cycle and Shore definitely demonstrates an ability to set text to music. The music merges with the verse harmoniously. It is quite atmospheric, at times with a cinematic quality as one can visualise images of landscapes while listening. On occasions the music is lyrical, romantic in nature, at times minimalistic but never incoherent. It really works as a song cycle. It is beautifully sung by mezzo-soprano Jennifer Johnson Cano who has an irresistibly warm tone and effectively expresses what the verses are trying to evoke. The Garden (Track 8), commissioned by the Julliard School on the occasion of its 100th anniversary, is an appealing choral piece almost religious in nature, with echoes of some of the vocals from The Lord of the Rings. It is very well sung by the 21st Century Chamber Choir but apart from the excellent verses by Robert Penn Warren, written in 1985, it was a piece that left me indifferent. This is followed by Six Pieces (Tracks 9 to 14) which felt a little disjointed to me, almost as if the composer was not quite sure where to go or what he wanted to achieve with this set of six short compositions. Each is very well executed: The first conducted by Howard Shore himself and the second performed by no less than the Kronos Quartet, which as one would expect, is excellent, but I still found the piece quite dry. To me personally, the best of the six is piece number five, again with lyrics by Elizabeth Cotnoir. It has a rather lovely melodic line and the verse is sung sweetly, with great tone purity, evoking the sound of children singing in an angelic style. The remaining pieces – Track 7, Peace, to a text by Eleanor Roosevelt and the final work (Track 15) Catania – are to my mind the highlights of this recording and are possibly the two pieces that will stay with you for longest. Peace is an interesting, unusual kind of composition. The music is set to quotes from Eleanor Roosevelt’s speeches and writings about peace. It is like a hymn to peace and was adequately premiered in 2007 at the Washington National Cathedral. The music is beautiful and Shore makes an excellent use of the organ, effectively played by Benjamin Hutto. The piece is very nicely sung by the Essential Voices USA Youth Workshop. The final work in this CD, Catania, is a lovely little gem, written for superstar pianist Lang Land and performed by him. The piece was written to honour the wedding of Sara DiMaggio and Jean-Jacques Cesbron (I assume they are some sort of celebrity socialites but to be honest I’ve never heard of them) in the town of Catania, located on the East Coast of Sicily. The piece is short but rather pretty, with an optimistic, light, luminous edge, as it should be for a wedding. It is lovingly and charmingly played by Lang Lang and one can imagine the people relishing the sun and the views of the sea. In all I found this recording pleasing. It is interesting to hear and appreciate Howard Shore’s various creative streaks and versatility. It is very different from the famous score to The Lord of the Rings and if that is what one might expect there will be disappointment with this CD, however if one approaches it with natural curiosity and the wish to learn more and understand the composer, then this is a good solid work with some enchanting moments.